Powerful, flexible infrastructure to support scalable workloads. High performance computing is all about scale and speed. And when you're backed by Google Cloud’s state-of-the-art infrastructure, you can accelerate your most complex HPC workloads’ time to completion. Competitive pricing and discounts help you stay within budget to convert an idea into a discovery, a hypothesis into a cure, or an inspiration into a product. 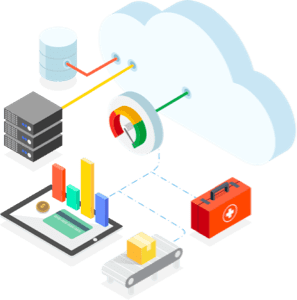 Google Cloud offers on-demand access to custom machine configurations that are billed on a per-second basis with committed use discounts and sustained use discounts available. Plus, get up to 80% cost-savings with Preemptible VMs. Accelerate insights with the power of the Google Cloud compute, networking and storage infrastructure. Build your own supercomputer using the latest Intel processors, NVIDIA GPUs, and Cloud TPUs with high-throughput, low-latency object and file storage. On Google Cloud, each team has access to their scalable, tailor-made cluster. This helps them solve problems faster, reduce queue times for large-batch workloads, and relieve compute resource limitations. Reference architecture for compute instances of batch jobs and fault-tolerant workloads. Reference architecture for adding autoscaling, backup head node, monitoring, and alerting components. Reference architecture for easily adapting and integrating on premises workloads to Google Cloud. From energy and manufacturing to government and climatology, global industries run their most demanding HPC workloads on Google Cloud. See how Google Cloud and Big Data tools can process petabytes of genomic, imaging, clinical, and insurance data in seconds. Bringing the numbers into view. Power quantitative research, portfolio optimization, and risk modeling on Google Cloud — capable of running clusters with a few hundred (or thousand) cores in minutes. Render faster. Broadcast on demand. Render large workloads, live stream videos to a global audience, and launch applications with the latest NVIDIA Tesla GPUs, even at peak times. This visionary research institution utilizes GCP to analyze human genomes 400% faster than on-site computing clusters — and at scale. Facing stability issues, an open-source financial trading community migrated to GCP to support the work of their 50,000+ quants. An award-winning French post-production company relies on GCP to handle massive computations without breaking the budget. Learn how our high performance computing capabilities are driving innovation for our partners. Learn how you can launch virtual HPC appliances running Altair and other HPC applications on GCP in our blog. Together with SchedMD, Google Cloud makes it easy to launch an auto-scaled Slurm cluster on Compute Engine. Learn how to deploy and use the Elastifile cross-cloud data fabric with Google Cloud Platform in our blog. See how NVIDIA and Google Cloud are helping you achieve faster results to address your biggest HPC challenges. See how Google Cloud and Intel deliver unparalleled performance that can handle compute-intensive business applications. Learn how to make sense of modern HPC architectures leveraging Google Cloud and your on-premise HPC cluster with the ECCoE. See Google Cloud high performance computing in action with these tutorials, solution examples, and videos.